About Us | JB Management, Inc.
Smart Solutions for Those We Serve. A small business with the maturity of a 28-year-old firm. We place a special emphasis on forging long-term relationships with our customers and teammates, earned through extraordinary service, attention to detail, flexibility, and strict adherence to our core values. 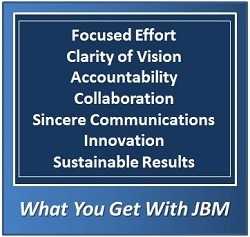 Based on our active, productive and long-standing network of partners, JBM enjoys a sterling industry reputation as a valued collaborator. Our streamlined, efficient management structure provides customers and partners with leadership that is responsive and directly accessible. We recognize that our success thus far has been built upon their trust and confidence, and we strive to continually refine our understanding of customers’ needs to exceed their expectations. We share in our customers’ passions and help them face a complex and highly dynamic environment by addressing short-term challenges swiftly, while still maintaining focus on the long-term, strategic implications to anticipate future opportunities. We have served side-by-side with U.S. and foreign partners as part of their teams in some of the most dangerous and austere environments in the world. Founded in 1990, JBM is a privately-held small business with proven performance, with an emphasis on creating and maintaining long-term relationships. Our exceptional reputation for providing extraordinarily flexible and tailorable support solutions that evolve with their customers’ changing requirements has made us a trusted partner with the clients we currently support. JBM has proven that, regardless of the environment, we provide world-class support to our clients to enable them to succeed no matter what the mission. We firmly believe that our company continues to be successful because we’ve maintained a strong emphasis on our core values of results, relationships, and responsibility. These principles drive our decisions by always maintaining the focus on our customers’ best interests. Copyright © 2019 JB Management, Inc.